Today we release a new version of SongKong and SongKong for Melco. As well as some bug fixes this release has some improvements particularly for customers that have High Definition (or HD) version of their favourite albums. 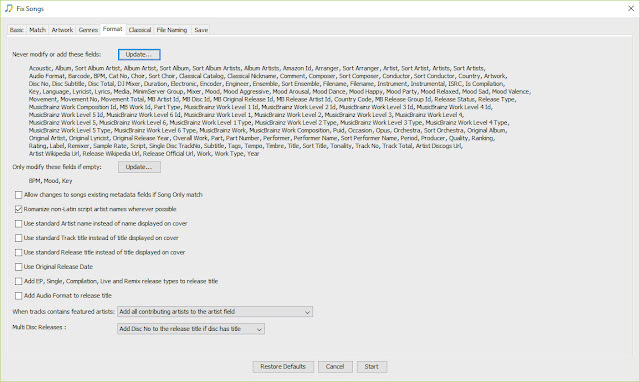 Sites such as HDTracks and Quobuz now provide many releases in 24bit format, this is better than the 16bit standard CD quality and is known as high definition (or HD). To really see a difference the record company needs to have created this version from a higher quality original source and you need a decent sound system , but if both these conditions hold the result can be stunning. 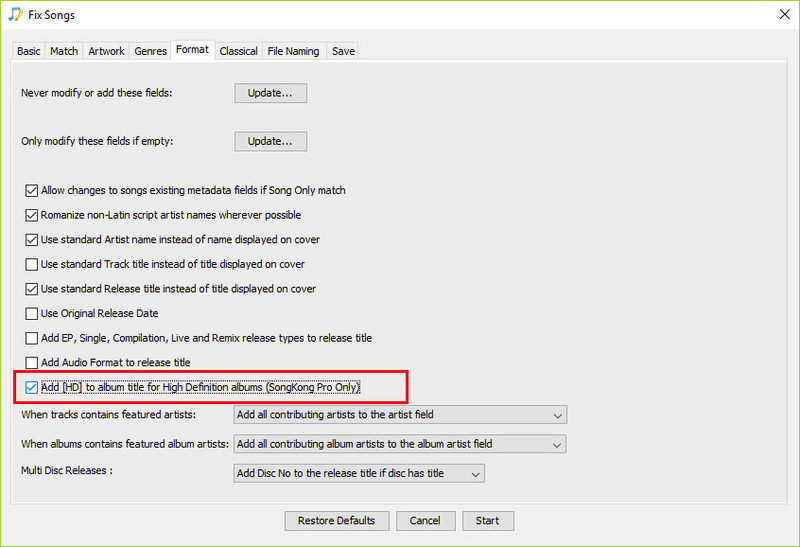 The new Add [HD] to album title for High Definition Album option does that, it adds [HD] to the album title when your songs are encoded in a lossless format at 24bits or higher. This option is enabled by default for Pro/Melco and Commercial customers. It means that if you have HD and non HD versions of the same album that you can clearly distinguish between the two when browsing via album. 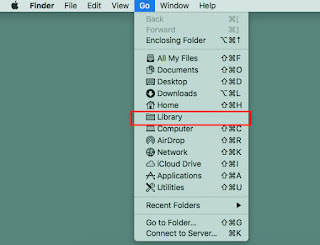 It also means that if you use SongKong to rename your songs using the standard folder = album organisation that it will be clear when browsing your music by folder. 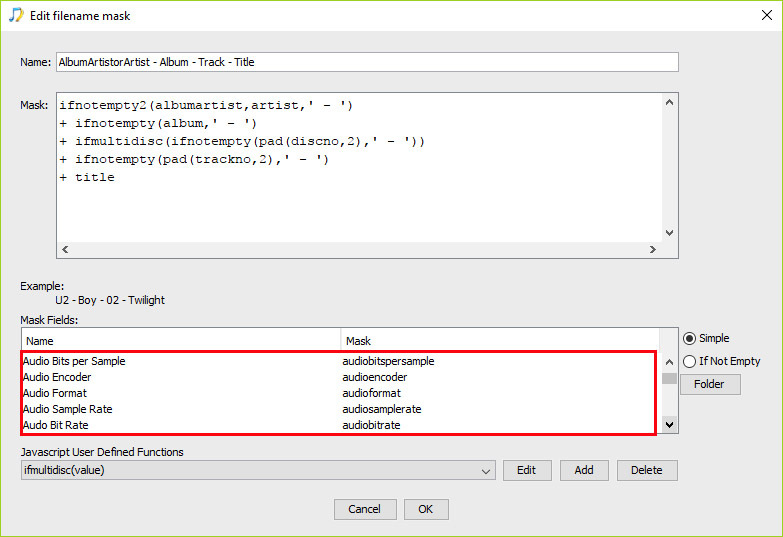 We also now set a new IS_HD metadata field to 1 when your song is encoded as HD. 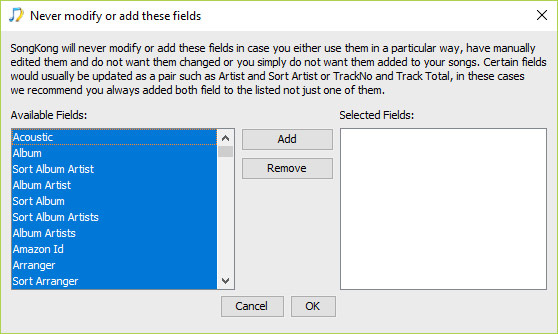 You can then use this field to organize your music in other ways, such as a top level HD and non-HD folders. You could also configure MinimServer to browser music this way, we already have a guide showing how to use boolean fields in MinimServer. 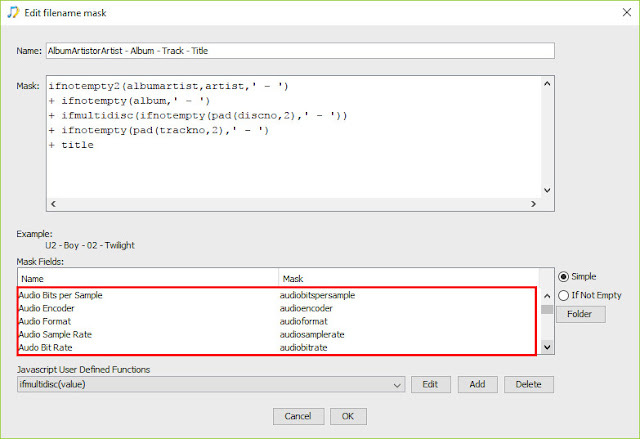 We also have added audiosuffix, audiobitspersample fields, adding them to the existing audiobitrate, audiosamplerate, audioencoder and audioformat. All these fields take their value from your actual recording rather than metadata. We are pleased to announce our plans for Jaikoz X, the tenth major version of Jaikoz. Firstly there are some important improvements we want to make how Jaikoz generally works. Jaikoz is slower than it could be to start up, and this is mainly because it has to read the user options, this is an encrypted Xml file. With hindsight there was no need to use an Xml file instead of a standard properties file, there is no need to encrypt it and Jaikoz does not need to read more than a few items at start up. We are going to replace the Xml file with a properties file, this is quite a task because it affects all preferences, but in the last two versions of Jaikoz we have used a properties file for new preferences so we have made a start on this. But an improvement in start up speed will not be seen until we have converted all the preferences so that the Xml file does not need to be used. The idea of the spreadsheet editing was always to let you display any columns you like and in any order you like to suit you. The trouble is that Jaikoz supports nearly 200 different metadata fields and the temptation is to display all of them but this can make the application rather slow and cumbersome, in particular changing the column ordering by drag and drop is very slow. 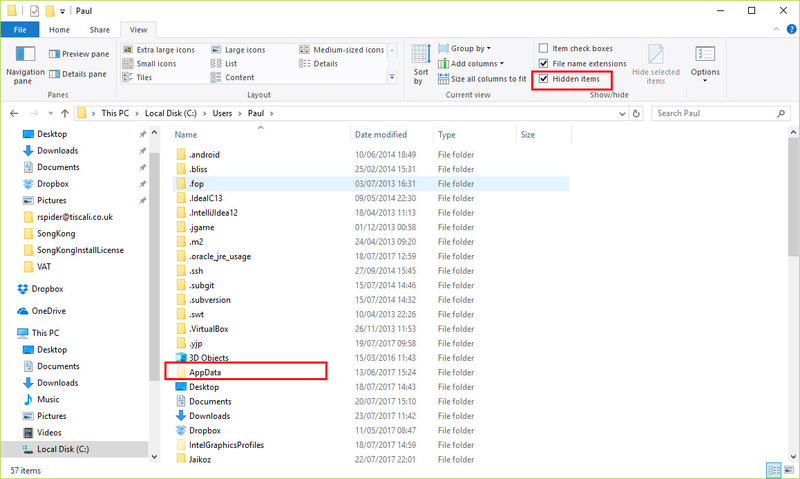 The solution is to have multiple Edit tabs, we already have this in the form of Edit and ID3 Edit tabs, we want to extend the Edit tab to have different type of Edit tab. There are some features in SongKong that should be part of Jaikoz as well, in some cases they are an improved version of a Jaikoz implementation. We want to update Jaikoz so that it has the same functionality as the improved SongKong Features. SongKong has improved file-naming, We will a add a list of pre created rename masks to Jaikoz, that can be edited plus new masks can be created and saved. And allow functions be saved independently so they can be used by multiple file naming masks. SongKong has Song Only Matching. 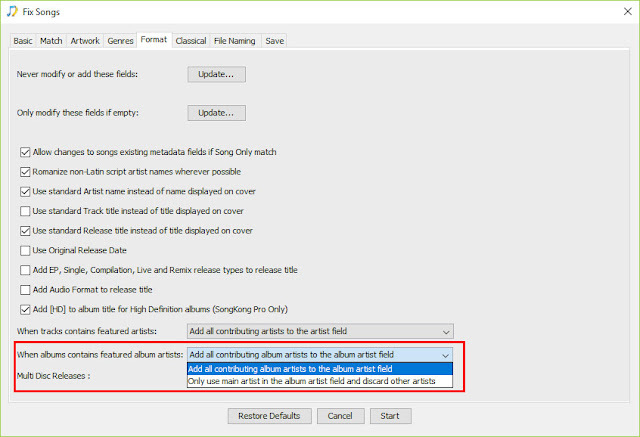 By default Jaikoz groups tracks logically and only allows a match if a release can be found that the complete set of tracks can be matched to, if only some tracks can be matched then no changes are made. However often Jaikoz can identify the song just not the album, since songs are usually available on multiple albums and usually the song can be correctly identified by its acoustic fingerprint but the particular album the customer has is not in the database. SongKong supports White and Grey Lists. We will add to Jaikoz support to only genre in a particular list with white lists, and convert genres from another value with grey lists. SongKong create a detailed Html report that shows exactly what changes have been made during a session, a similar report would be useful in Jaikoz. For many customers the most important metadata that Jaikoz can add is artwork, in fact for some customers that is the only artwork they want Jaikoz to add. Currently we can only artwork if we have had a Discogs or MusicBrainz match and they have a link to artwork, however there are many cases whereby the existing metadata is good enough to find cover art for other sources even if the album is not available in MusicBrainz or Discogs. We want to add artwork in these cases. 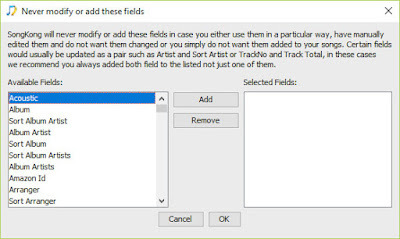 Jaikoz supports nearly 200 metadata fields, but we realize that sometimes you need to add fields that we don't support, maybe for compatibility with a legacy application or for other special circumstances. We would like to add support to allow you to create custom fields as required. 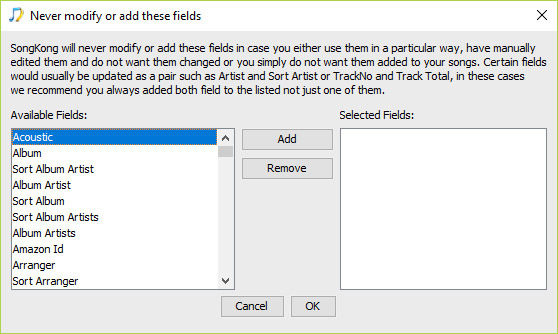 This is a long requested feature that would let you set the value of a field based on another field, e.g artist=albumAlbum. We plan to implement this in a similar way to file-naming masks, allowing you to save multiple tagger script snippets that be applied to selected rows as required. We are very excited about these plans and would welcome feedback on these ideas at this time. Also if there are major critical features that you think are missing for this list let us know, nothing is set in stone at this stage. Today on October 17th 2017 we are pleased to announce a new release of Jaikoz. 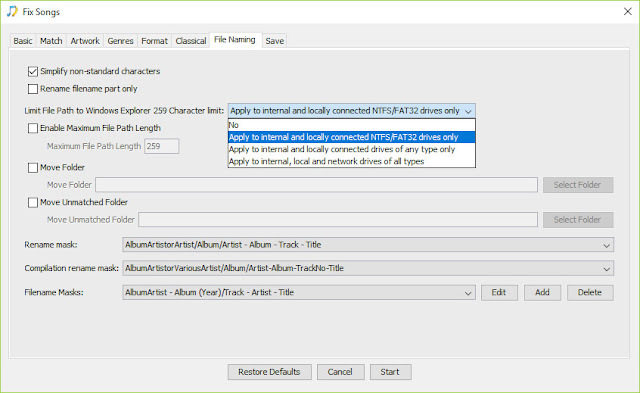 MinimServer is a powerful uPNP server that can be used to stream to uPNP devices, it is typically used to stream music from high end audio systems but can also be used just as successfully on a PC or Mac. It has a way to group tracks that is especially useful for classical music with the MinimServer Group field (note this is different to the more common Grouping field). We already had support for automatically updating this custom field with SongKong. We now support automatic updating with Jaikoz, and of course with Jaikoz you can manually edit the field as well. Jaikoz already had support for the Work field. Typically with classical music tracks represent movements that are part of a Work. But sometimes that Work is part of a larger work, most notably Operas that have recordings linked to Scenes that are parts of Acts, that are part of the overall Opera. 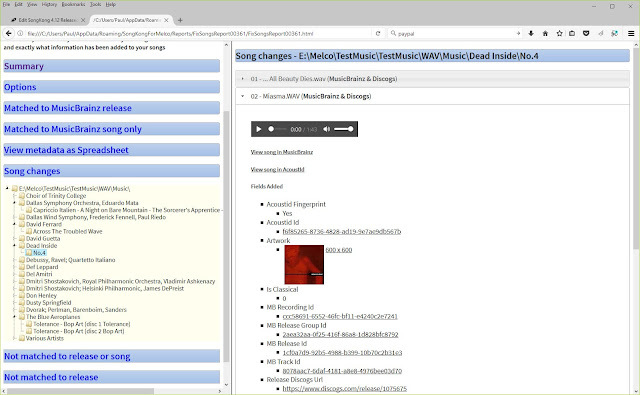 Jaikoz already adds performers and their instruments when matching the releases on MusicBrainz and Discogs. This information is stored in the Performer field in the form Person:Instrument for ID3 formats such as Mp3 and Wav, and Person (Instrument) for VorbisComment formats such as OggVorbis and Flac. But now we add the person only to the PerformerName field and the Instrument only to the Instrument field. This means you can easily sort or index your music by the instruments used. In a similar way to how the ISRC field can identify a unique recording the ISWC field can identify a unique work. Artists and labels can have an IPI, this is used to identify the interested parties of an ISWC (such as the composer of the work). We have now added ISWC and IPI fields to Jaikoz that can currently be manually edited, in a future release we will automatically add the metadata from MusicBrainz. For Multi-Disc releases it is sometimes useful to just consider the releases as a single disc release. This is the purpose of the SingleDiscTrackNo release, Jaikoz automatically adds this data when releases are matched to MusicBrainz. 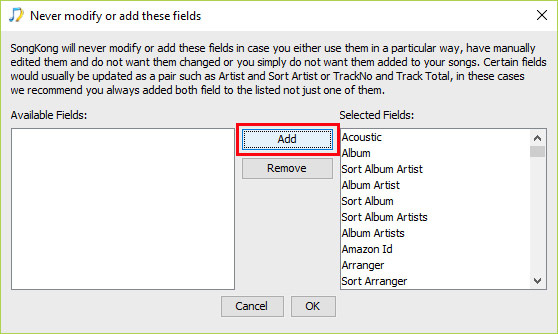 This field can be used in music players instead of the TrackNo to view albums as single disc albums. We already have sort fields for most people, such as the composer, conductor. Now we added a sort field for the lyricist. Today we release a new version of SongKong. Not many new features in this release but we have blasted away thirty bugs. Many of these were obscure ones that had only been reported once, but there were some larger ones in there as well. We hope with the next release we should be able to virtually eliminate all the remaining bugs. This should help reduce time spent on ongoing support and let us concentrate on some really cool new features. 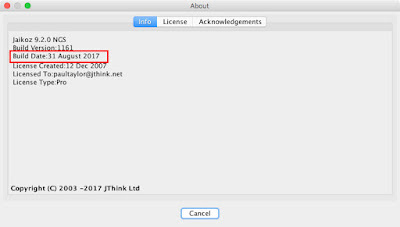 We have found that the later versions of OSX Sierra no longer have the Java Applescript library installed. SongKong requires this to update iTunes, and it wasn't accurately reporting the issue either. This new release comes with the missing library as part of the SongKong installation. 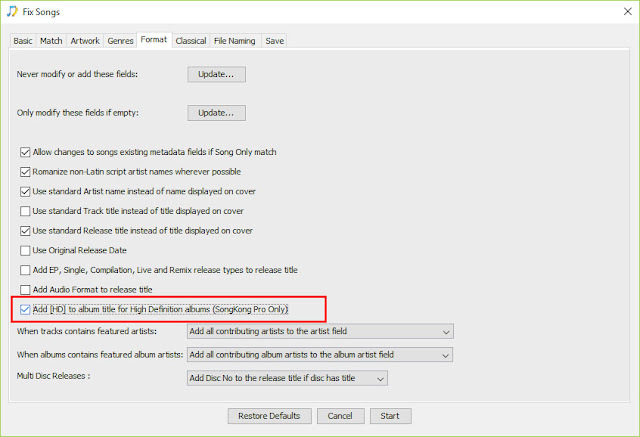 Too often SongKong was re-saving songs that had not actually had any changes since the previous Fix Songs task. 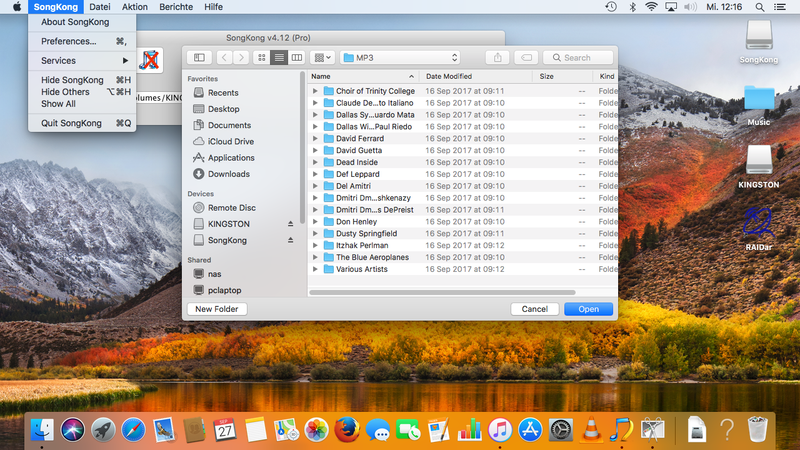 This could make the report a little confusing, and increased the total processing time, especially if SongKong was configured to update iTunes. We have now fixed this, note in the report the Songs Saved bar chart only shows files that have actually been changed. It is the Songs Completed bar chart that shows the successful completions, to highlight this it is now the last bar in the bar graph. We have one new feature in this release (for Windows users only). 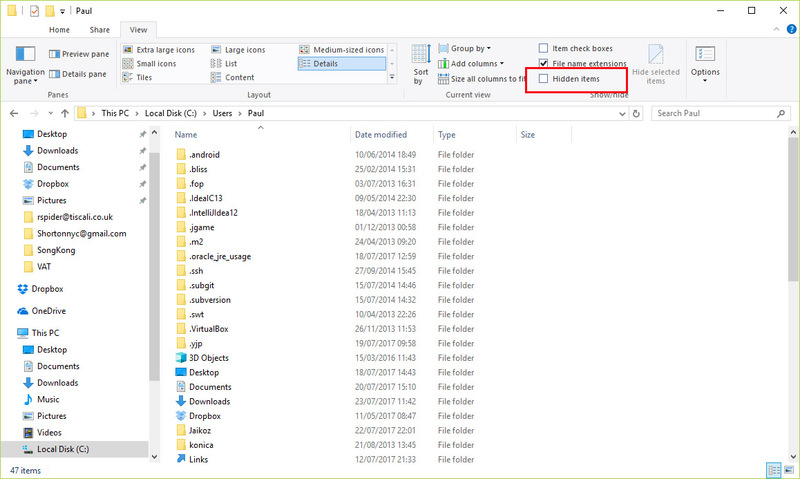 On Windows the file path is limited to 259 characters, but this is only a limit of Windows not the underlying file system and it can be rather limiting sometimes, for example Classical releases. 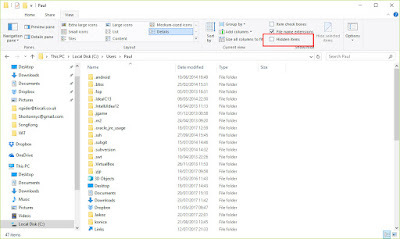 Whilst is usually wise to adhere to this limit for files that are intended to be usually be used on Windows it is not so necessary for external or networked drives that are only temporarily being accessed via Windows. For example you may be using SongKong on Windows to access a Linux NAS drive. Whilst SongKong can run on Linux a NAS will not not let you use the GUI, you'll be limited to using command line. And in some cases it will not be possible to install SongKong in the first place, so this is quite a common scenario. 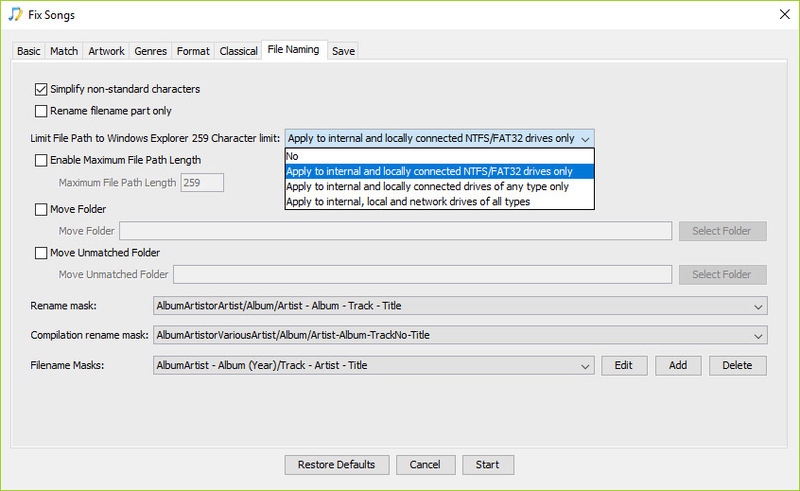 You can use the new Limit File path to Windows Explorer 259 Character Limit option to not set the limit, or set the limit only for local NTFS/FAT32 drives, this is the default. This stumped me for a while since I had already double checked that I had made no code changes to the iTunes part of the code base. I delved further and realized that the error message was misleading the problem was not particular to creating a playlist folder, it was larger than that: Jaikoz could not find the Applescript Engine. I then remembered I had modified the build script, and in doing so had inadvertently dropped the required AppleScriptEngine.jar from being part of the final release. Its always the 'minor' changes that cause the problems. 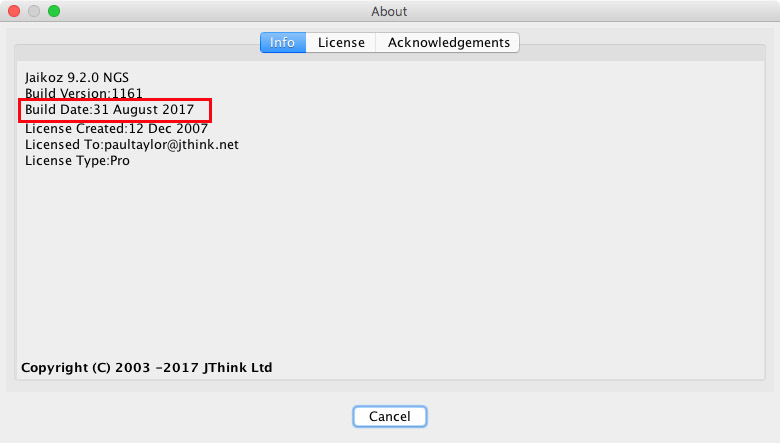 This file is installed as standard as part of the legacy Apple Java 6 version so my development machine continued to work but the file was not on my second machine, it came with Jaikoz 9.1.0 but not not with Jaikoz 9.2.0. So I hope some of you found that explanation diverting, and we have now fixed the problem. SongKong for Melco is not restricted for use by only Melco customers. But it has been designed in conjunction with Melco to solve the some of the issues that Melco customers have had with their metadata. We have concentrated on getting it working seamlessly with the MinimServer UPnP server, since this is the most flexible UPnP server I have found, best able to utilize SongKongs' superior metadata coverage. As a Melco user it is likely that your music files are either in Flac or Wav format. Please be aware there are some issues with Wav format if using Twonky. If SongKong is used to update your songs directly on the Melco via a network share then Twonky can be over zealous and start rescanning as soon as it notices any changes instead of waiting until SongKong has completed. This extra processing will slow down SongKong so it is best to temporarily disable Twonky from running on Melco whilst updating from SongKong. 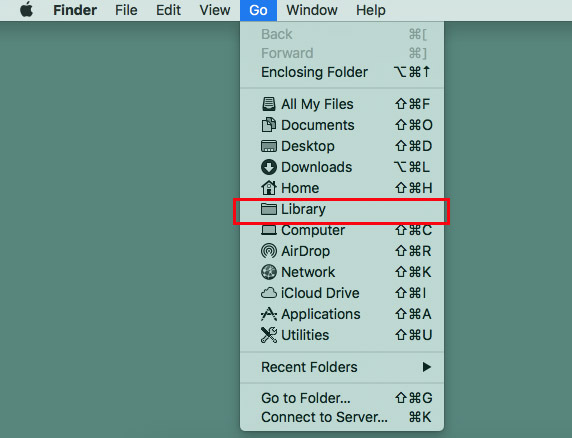 This affects all Mac users of Jaikoz and SongKong, Apple have recently released the beta of their latest mac operating system High Sierra. Unfortunately this update currently has a bug that means that the main toolbar will not display for any Java based application. So please be advised that if you depend on Jaikoz or SongKong please do not install High Sierra at this time. In the last release we moved the license information from songkong.properties to license.properties as a first step towards allowing customers to have multiple configurations. This worked fine for existing customers but there was a problem for new customers. 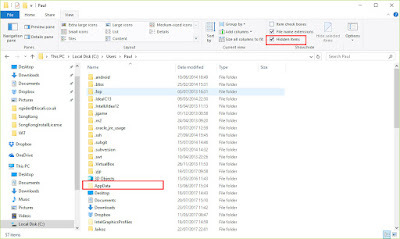 When a new customer entered their license details the changes were not actually saved to the license.properties file, so they had to be re-entered on each restart. Sorry about that, this release fixes this issue. This has some important improvements and fixes. Before this release Jaikoz always used a cached copy of all the AcousticBrainz metadata on Albunack. So if a MusicBrainz song had been analysed with AcousticBrainz to determine its acoustic properties (such as its BPM or the key it is played in) that information could be added to that song with Jaikoz. But AcousticBrainz have not been making the new data available so now we have switched Jaikoz to lookup AcousticBrainz directly. 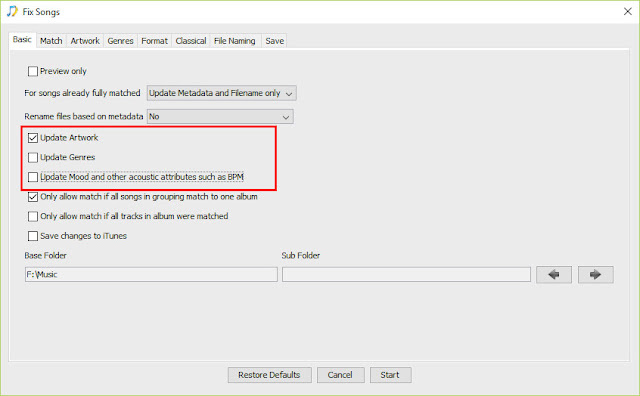 This should mean that you can now update many more of your songs with AcousticBrainz metadata. There is also a classical_composers.txt file, like all automated music taggers Jaikoz is always dealing with incomplete databases, a particular problem for classical music is that the database may have the list of credits for a release but not their particular role, e.g. Is Person B a composer, performer or conductor. Jaikoz has created a list of people who principal activity is composing so when we find this person credited on a release we can usually assume that they are the composer even if they do not have a composer credit on that particular release. The smaller classical_conductors.txt list works the same way for conductors, both these files can be edited in the same way as the classical_people.txt file in order to fine tune your classical metadata requirements. If a person is a composer and conductors (or performer) then they will not be included in the composer/conductor list unless the vast majority of their credits are for one particular role. The not_classical_release.txt list is an exception list to specify releases that should never be considered a Classical release. 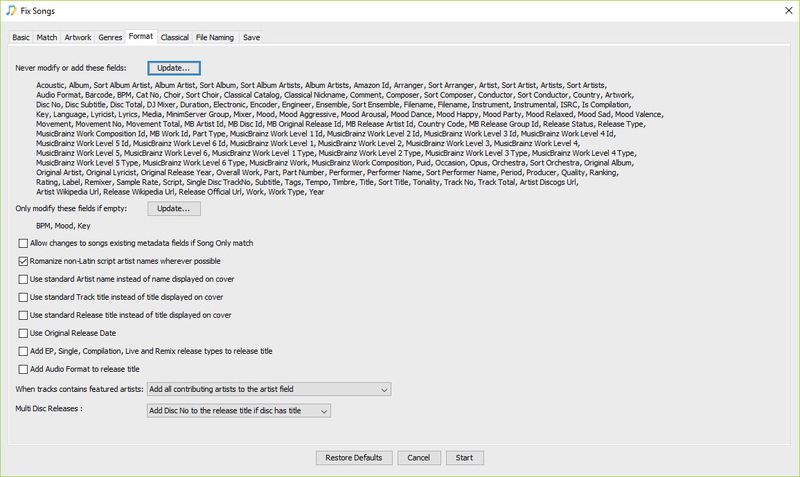 Some releases are borderline Classical and Jaikoz algorithm can sometimes get it wrong, adding a MusicBrainz Release Id and a title to this list ensures that Jaikoz does not treat these releases as classical when using its identify classical algorithm. Note, none of these files can be edited directly with Jaikoz itself, just use your favourite text editor. A bug in Java was exposed by a new release of Windows, Oracle have now fixed Java and this version of Jaikoz has been updated to use this version. It was possible for Jaikoz to tag Classical releases so that the album artist was not set consistently. 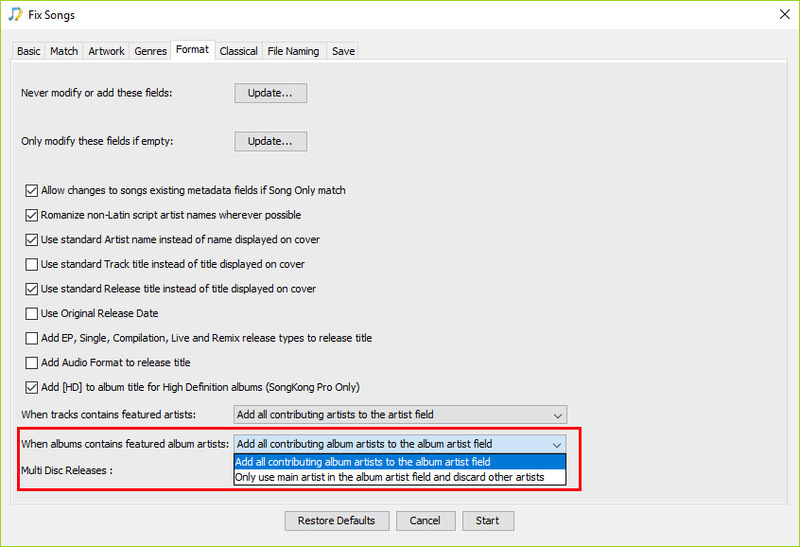 This can cause issues for players and hence the album artist should always be set consistently over an album. This is fine but with SongKong 4.10 we moved license details into a new license.properties file. 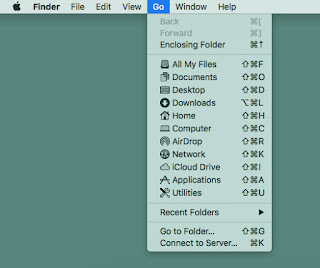 You can now edit the file directly instead. This can be useful if you are running SongKong without using a Gui such as on a remote linux server, or if there is a license issue. If no such file exists just create a new license.properties file and add the three lines, then start SongKong and it will use your new license details. The only difficulty can be finding the SongKong User Folder, this is not the same as the Installation Folder. The SongKong User Folder is where we store your user specific settings, and this location varies for different operating systems.